Organising your study; How to make notes; How to tackle a textbook; Effective Reading; Effective Memory; Case Studies; Tips on Presentation; Examination Stress; Examination Faults; Examination Technique; Academic Writing; The Brain and Learning. Better Exam Results will help you develop proven study and exam techniques. Step-by-step it guides you through the various stages of learning from planning your study time, to reading, making notes, revising and preparing for exams. Learning to learn is an essential skill for students and much is known about the brain's learning potential and how people learn. This knowledge is available in this book. Don't rely on hearsay, apply the systematic approach in this book to improve your learning ability. 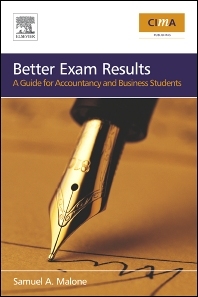 For students studying for accountancy and more generally business qualifications.